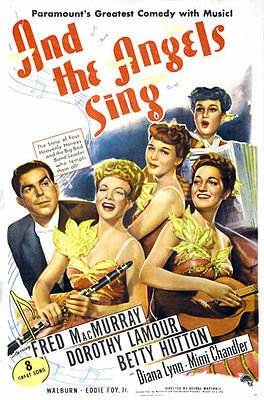 It would be difficult to find a song with a more unusual history of success than the swing era classic, “And The Angels Sing.” Originally an instrumental with a Jewish klezmer-style segment, it would later have lyrics added and become a hit record for a famous big band, while at the same time turning into a signature song for both a vocalist and a trumpeter. It would also be the inspiration for a Hollywood musical that — oddly enough — did not include the song. Leading his own band, trumpeter Ziggy Elman (b. Harry Aaron Finkelman) had originally performed an instrumental he’d written and named “Fralich in Swing,”which featured his distinctive klezmer-style solo half-way through. But by the time Ziggy joined Benny Goodman’s band in the late 1930s, Johnny Mercer had added words and the song had been renamed “And The Angels Sing.” After its performance in Goodman’s famous 1938 Carnegie Hall concert (maybe – but more later about that) it became a number-one hit and made a star of vocalist Martha Tilton, while also bringing a lot of attention to Ziggy Elman. Nice to hear from you again. Thanks for writing. The history of “And the Angels Sing” goes back farther than the article indicates. Ziggy took as his starting point a traditional Klezmer (European Jewish Folk Music) tune known as Stille Bulgar, which means “Quiet Bulgarian Dance”. He slowed down the melody to serve as the tune for the swing part of the song. Then he played the trumpet solo with the original Klezmer feel. Born Harry Finkelmen, he thought he could do better in the music business if he had a non-Jewish sounding name, so he picked Ziggy Elman. But did he actually think that taking the name “Ziggy Elman” would fool anybody? Artie Shaw was more imaginative. Thanks for the earlier history of the song, Tom. My original source didn’t mention that. I wonder if Ziggy played it down a little…after all, it was his claim to fame. Ziggy Elman was my cousin! That song was NOT performed at the Carnegie Hall Jazz Concert. “Bei Mir Bistu Shein” another song with a Ziggy Elman klezmer like solo was performed instead. So you’re agreeing with the scenario I described in the last paragraph of the article? I think that too, but I’d like to know your source because it’s something I’ve always wondered about. sorry, but your ‘final oddity’ is bupkis. i have a copy of the 2-disc, 331/3rpm, 12-inch, vinyl LP and i assure you it WAS performed at the 1938 concert.